Dr. Allen Bradley Morgan (1831 - 1899), a member of the Royal College of Surgeons in London, was described as an intelligent, tall young man. Morgan emigrated from Ireland, and came to Wagga Wagga as the town's first doctor. 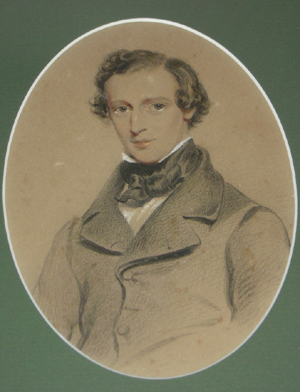 Aged in his early twenties, he was regarded by most, including J.B. Edney, as "a gentle, good and very skillful man". Dr. Morgan dispensed all sorts of medicines at his residence until 1859 when he erected a dispensary at the corner of Gurwood and Trail Streets near the Commercial Hotel. He attended a wide area and gave great satisfaction. The public spirited young doctor supported all moves to advance the town. In 1859 he married Emma Louise Hume, the daughter of Francis Rawden Hume. He and Emma occasionally traveled to Goulburn, and on one occasion (in 1866) were on the Goulburn Mail when it was stopped and robbed on the Great Southern Road, twenty miles from Goulburn. Generally, Dr. Morgan was inundated with work. He was devoted to the Wagga Hospital and his personal and collected contributions to its funds were quite considerable. By 1868 his health and strength had failed - he requested and obtained twelve months' leave of absence for a trip to the "old country". Although offered full salary during his absence, the kindly Doctor declined to accept it. At his official farewell the Wagga citizens, represented by F.A. Tompson, placed on record publicly their "deep and sincere regard" for him as he had won the "esteem and respect of all those with whom he has been associated". Dr. Morgan returned and resumed his practice in June 1870 but remained just over two years. By the time he resigned early in 1873 he was a very wealthy man. He had invested wisely and accumulated much property. Apart from his brick residence at the corner of Gurwood and Trail Streets, he owned blocks in Gurwood Street, Trail Street, Thorne Street, at the corner of Murray and Morgan Streets, the whole section 66 bounded by Kincaid, Gossett, Gurwood and Shaw Streets, most of Section 81 bounded by Shaw, Albury, Docker and Bolton Streets, and many others. As well as land in and around Wagga, he had extensive pastoral interests at Kolkibertoo. He was also one of the original Directors of the Wagga Wagga Bridge Company which opened to traffic in October 1862 and proved a lucrative investment. Morgan sold a lot of his property in Wagga, including his former residence and surgery in December 1874. He eventually returned to Bowral and died at the St. Helen's Hospital in January 1899 in his 68th year. Dr. Allen Bradley Morgan is today remembered as Wagga;s first resident doctor. This painting provides a gentle, private view of an educated man with huge responsibilities within the public eye. For more information regarding Dr. Morgan, and Wagga's medical history see Sherry Morris, A delicate Balance: A History of Wagga Base Hospital, 1988.